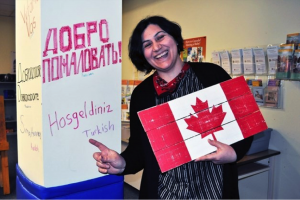 Local support centres are providing newcomers to Canada such as Gokce Saglampolat the opportunity to put down new roots, develop new skills and embrace life in their new country. “Everything was so different and such a shock,” she says, especially for a woman who lived and worked as a graphic designer in Turkey’s capital city of Istanbul, which is home to more than 15 million people.This is the second in a three-part series about newcomers in BWG, the challenges they face and where they can turn for help. The couple lived in Toronto and Maple before moving with their two-year-old son and baby daughter to BWG in 2011. Saglampolat credits the non-profit Bradford Immigrant & Community Services (BICS) organization and Community Action Program for Children (CAPC) Bradford — a program of Catulpa Community Support Services funded by Simcoe County — both located at 11 Holland St. E. for helping her navigate many of the obstacles that newcomers face. “We work with families to help them understand Canadian culture, laws, the school system and parenting practices,” explains CAPC site co-ordinator Brigette Saniga, pointing to various workshops, school readiness programs and one-to-one support and advocacy offered via the partnership between the two agencies. That includes the commissioning and translation of documents, settlement assistance, integration to Canadian society programs and English language instruction, as well as immigrant support groups run in partnership with the BWG library the second Wednesday of each month. “We do not assume they already know,” Saniga says, adding newcomers such as Saglampolat are informed not only about what the laws are, but also what their rights are. Parenting here is a lot different than in Turkey, Saglampolat agrees, but adds the staff at the two organizations “made a huge difference,” not only for Saglampolat’s peace of mind, but also her sense of belonging in the community. “From the first day I came here with my two kids, the people have been so wonderful. It is like a family here and they helped me a lot,” she says with a beaming smile, not only with obvious gratitude and admiration, but also impeccable English. English classes offered helped break the language barrier for Saglampolat. With usually close to 30 people taking a class at the same time and 15 of those speaking as many different languages, the experience is not only fittingly multicultural, but also representative of the vast number of diverse cultures calling BWG home. “So many people from different cultures are connecting and that is very unique to Bradford,” Saniga says. Through BICS’s partnership with Catulpa, Saglampolat also participated in the parenting program. 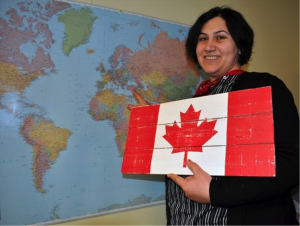 As a result, Saglampolat was eligible for the skills training program to gain Canadian work experience and now works with Catulpa’s MotherCare program as a children’s program team assistant. Between that, working part-time in a local restaurant and cleaning offices after hours, as well as getting her Canadian citizenship after her kids started school, Saglampolat is continuing to upgrade her English so she can go on to either college or university. Interested either in early childhood education or social work, Saglampolat says the opportunity to choose is just one of many freedoms she is thankful for in her adopted homeland. She also loves her new hometown. That includes her extended family at BICS and Catulpa. Saniga says Saglampolat pushed herself to seek out help, but not everybody can do that. Learning has no age limit for Manuel Maria Hernandez Jimenez. Born in Colombia, he came to Canada with his family in 2003 to escape the daily environment of kidnappings, assissinations and extortion attempts in his home country. He had to sell the family printing business that he operated in Colombia for 35 years. 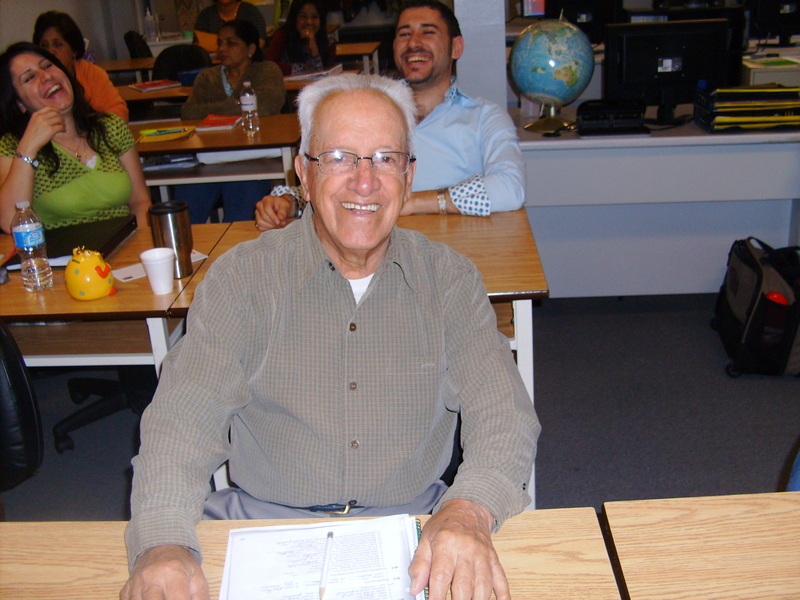 Now, at age 85, he continues to enjoy learning English through LINC classes at Bradford Immigrant & Community Services. Manuel came to Canada unable to communicate in English but can now bank, shop and go to church with comfort and confidence. He has learned to write in English and enjoys reading English newspapers. He enjoys studying with students from many different countries and is very interested in their cultures. His LINC classes give him English skills, frienship and an opportunity to socialize. Manuel is an active member of his church choir and often entertains his classmates with songs from his youth and native country. Manuel says, “The support I have received through Bradford Immigrant & Community Services has reduced my isolation and supported my integration into Canada.” Manuel is much-loved by his classmates and instructors.